How can I change the responsive breakpoints (advanced)? How can I have a different menu on a specific page? Menu items that don’t link to another page? I switched themes and UberMenu stopped working. Why don’t I have any UberMenu Widget Areas available? Why does Internet Explorer want to destroy my life? Is there a non-WordPress version? How can I prevent UberMenu from adding CSS to my site head? Why aren’t extensions included in the core plugin? When I use the columns shortcode, I get a PHP Warning. UberMenu is unstyled on the login/registration page. Ultimatum provides lots of flexibility, but its Ultimatum Menu Element does not seem to implement WordPress Menu Theme Locations, and therefore it does not meet the UberMenu requirements. 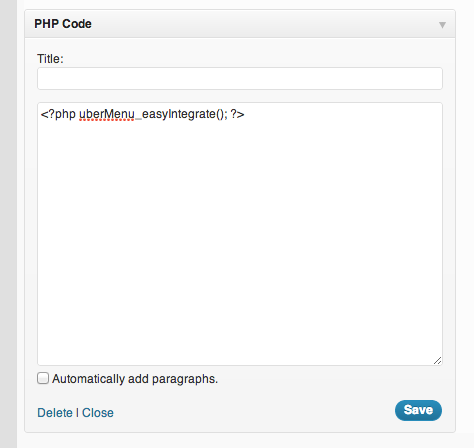 To integrate UberMenu, we’ll need to add a bit of PHP code that follows WordPress best practices of using Theme Locations instead of menu names. Once that is installed, instead of using an Ultimatum Menu Element in your Header Layout, add a PHP Code Element instead. Don’t forget to follow the remainder of the Easy Integration Steps, including setting a menu for the UberMenu theme location and activating it.